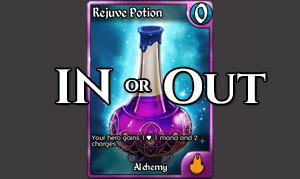 As one of the most significant changes made to Kingdoms CCG, this release impacts most areas of the game. Most significantly, the early sets of Eve, Rise and Tribes are no longer available. Some of the cards from these sets have been moved to our new "Core" set, while the rest (and any cards removed from the old Core) now make up a new set called "Legacy". Please refer to our previous blog posts for more information on this change. Important Note: Decks that had been in the Beginner's Arena are still currently listed as being in that Arena. We are working on a fix for this and to remove any deck that is not Standard/Limited legal from the AI side of these arenas. We decided not to hold back the release any longer to fix this issue. We will have this fixed as soon as possible. Rak'Mul is now 3/5 and deals 1` damage to enemy creatures on attack. 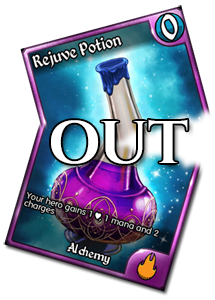 Hose Down has been reduced in cost from 3 to 2 mana. Beastmaster now has the subtype Beast, but will not tutor for other copies of itself. Birth of a New God has been reduced in cost from 3 to 2. 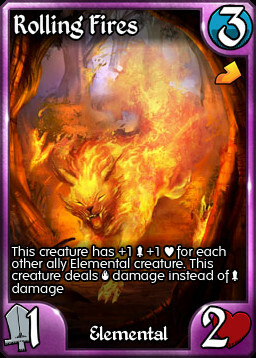 Return to Elements reduced in cost from 5 to 4. 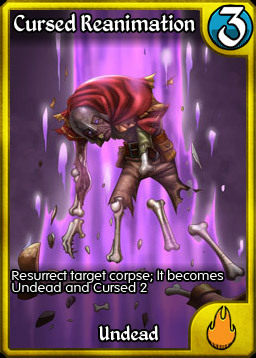 Cursed Reanimation has been reduced in cost from 4 to 3. Vulgrath's Staff of Repression now triggers on Enter as well. Recoil has been reduced in cost from 3 to 2. Gear cap implemented. Heroes can have a maximum of 8 gear in play at any time. 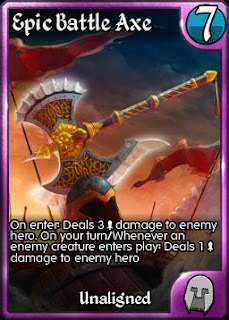 Standard and Limited formats are now only made of Core, Light Ascending, Descent into Darkness, Gods Reborn, and all Arsenal, Guild, Promo and Premium (aka Holiday) cards. All cards from Eve, Rise, Tribes and the old Core that are not in the new core are now in the Legacy expansion, and are only legal for Legacy play. NOTE: Alternate Art promo cards of cards that are in Legacy are NOT Standard legal. The expansion of the original version takes precedent. Tribes Two has been split. 2 rares from each Kingdom have been moved to Premium, and will remain Limited/Standard Legal. The Epic and Essence card from each Kingdom will remain in Tribes Two and will only be legal in Legacy. New Player decks have been updated to be Standard/Limited legal. New Player icons have been added at the 2000 and 5000 win levels. Player Profile pop up now shows cards collected from LA, DiD, Reborn and Legacy. The Volume of all of the Battle Music has been reduced to a more pleasing level. Try it out, you might even leave it on now ;). "Holiday" cards are now called "Premium"
Beachball is available now in Promo Singles. It unlocks when you have 10 wins. Core Packs have been updated. Basic packs have 10 cards, including a guaranteed rare, Epic, or Legendary. Core Premium packs have a better chance at Epic and Legendary cards PLUS may include multiple rares. Eve, Rise, Tribes packs have been removed from the store. Starter Decks updated to only include cards in the new Core. Legacy Arena added, Beginner Arena removed. Arena prizes adjusted for all Arenas. Beachball is now the Top 50 Promo card for the Standard arena. Nimble Fae is now the top 100 Promo card for Limited and Legacy arenas. Arena Prize levels have been adjusted. NOTE: Limited and Legacy arenas are showing the Standard prizing in their Leaderboards. Limited and Legacy prizes award fewer gems and the Alt Art uncommon rather than the Premium Promo. Grovenhold's War March triumph bug has been fixed. Thanks to Mordoc for pointing this issue out to us. The Tournament Schedule has received a full overhaul. Constructed Tournaments are now just Limited, Standard, and Legacy. Sealed and Draft are just Core and New Age. Yes, we now have New Age draft. Enjoy. Max Essence has been increased based on your crafting level. Level 10 can now use up to 350 Essence for a better chance at getting an Epic. Basic stones: Creatures, Spells, and Gear can now craft any card from Legacy, Core, Light Ascending or Descent into Darkness. The Rune Word stone will no longer be created in the game. Existing stones have not been adjusted. Eve, Rise and Tribes stones will now craft any card from the Legacy set. Reducing almost 700 cards down to 229 cards was no easy task. Each Kingdom had to considered separately and together. How well did the Kingdom's cards work together? How well did they play in Sealed deck? Where was their power in Constructed? Beyond this there was the overall power level of Constructed to consider. If the goal was to create more strategic, interactive battles, what should the role of gear be? Removal? How powerful should combo decks be? All of these questions led to some very difficult decisions that needed to be made. For every card added in, 2 had to leave, so the cards added had to result in an exciting, fun environment. Here is a look at a few of these decisions and the reasoning behind them. One of the goals in New Core was to tone down the aggressive, haste based builds. Haste is by far the most powerful creature ability, and as the number of creatures with Haste grew, the deck became more and more difficult to handle. 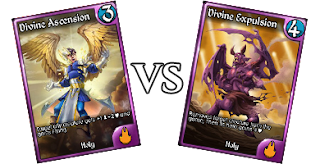 Even with four anti-haste cards in the game, haste-based decks regularly won both Limited and Standard tournaments. One of the best ways to beat haste is with a board of blockers. Sure they'll die, but at least the creature doesn't hit your face. Except Maelstrom Phoenix. 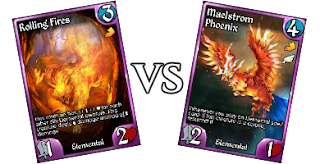 Combining flying with haste, and throwing in the ability to resurrect for free, turned the Phoenix into a constantly repeatable source of damage that laughed off creature combat and most removal. It was time for Phoenix to go. 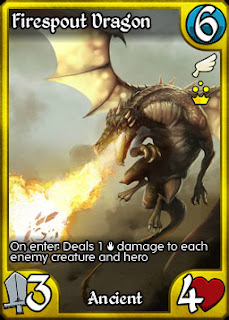 Rolling Fires on the other hand is a popular, powerful haster that has found its way into many top decks over the years. With Phoenix out, we suspect that it will quickly become the replacement of choice. Staying with Elemental, which by far had the most "good" options to choose from, came this dilemma. 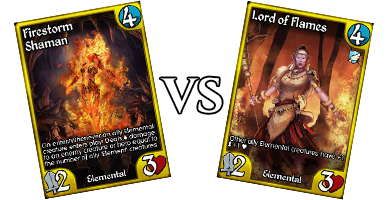 Undead and Holy already had their "lords" in the set, so Lord of Flames was the obvious choice to include. Obvious, though a little boring. 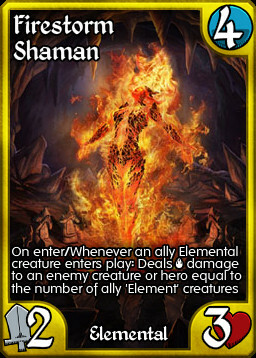 The other "Four Mana 2/3 Rare" choice was the very powerful Firestorm Shaman. 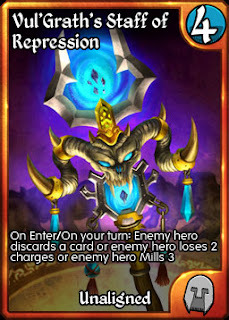 At points in KCCG's history Shaman decks dominated like few others. Those days have changed though. Now we have tougher creatures overall, significant options with Resist, and the core problem deck - Dravkas turning Manacycle Wizards into Shamans - is impossible to build outside of Legacy. So we've put the Shaman into Core. 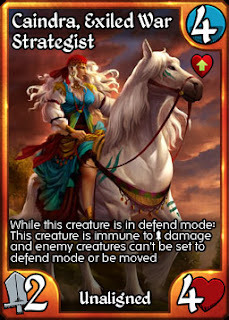 Combined with the other changes to Elemental, we felt that she will remain a very powerful option, but be no stronger than other top rares. Let the Shaman brews begin! 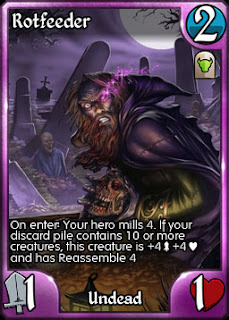 Reanimation is a core tenet of the Undead arsenal, and I knew that I wanted the effect as part of the new Core. The issue was which rare should it be? Dreadful Return still saw play since hitting 3 mana, but was solely used for cheating milled big creatures into play on the dead backs of little creatures (like turning rats into legendary demons). Cursed Reanimation was actually closer to what Undead is meant to achieve, but it was largely unplayed. 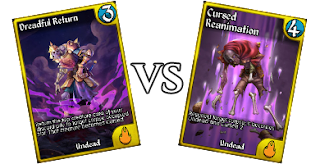 In the end we decided that cheating mana costs was something that we were moving away from, so Cursed Reanimation was the choice, but we needed to make it better. The effect was fine, so a quick mana cost buff and we had our card. This was the most difficult decision of the whole set. 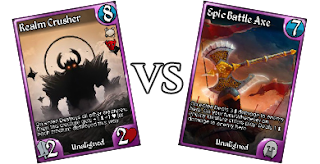 Both of these cards are loved by those who play them, and hated by those who have to play opposed to it. 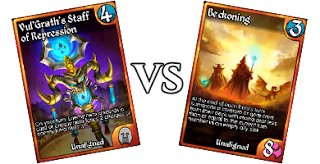 Both are huge threats, but Realm Crusher isn't just a threat, he's also a solution. 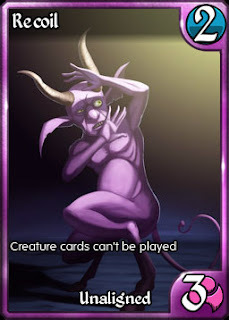 In a CCG cards generally are either a threat, or a solution. Mindshocker is a threat. Disintegrate is a solution. Threats are more powerful overall than Solutions. That Mindshocker will win you the game if left unchecked. That Disintegrate does nothing until your opponent plays something to kill. 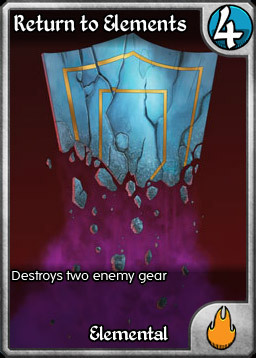 Realm Crusher combines both of these attributes into a single card. It clears nearly any board state, and leaves behind a massive threat that isn't easy to deal with. Essentially, it does too much. Additionally its place in the environment overrides every other mass kill card in the game. Why play Divine Wrath or Stone Barrage when for 2 or 3 more mana, you can have a 5/5 monster ready to attack back? For these reasons, Epic Battle Axe was the final decision. Removing Realm Crusher takes pressure off creature based strategies, and EBA does best in those environments. This was another tough decision. Beckoning started on the list, but as we refined our goals, it began to lose its luster. Beckoning is the kind of card that is perfect for the top tiers of Guild play, but that has little value to players who are just starting out with their collections. As well, it is the very definition of cheating mana costs. It became clear that this was a perfect Legacy card. On the other hand, Vul'Grath's Staff wasn't quite up to the level that we wanted in New Core. I have a soft spot for the card as it was the very first Legendary that I opened when I was a new player. Even then I realized that the card was a little underpowered, as it had no impact when it was first played. We've fixed this long standing issue by adding an "On Enter" to its effect. Now it's a Legendary worth a spot on the list. To be honest, this wasn't that difficult, but it was changed during development based on your feedback. 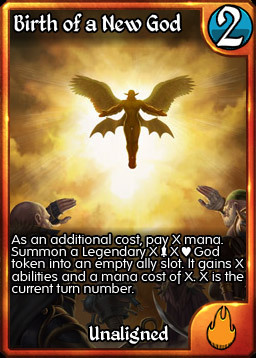 Divine Ascension was the pick, as it is an iconic Kingdoms CCG card. I wasn't 100% happy with the pick though as since it was nerfed back in 2013, the card has rarely seen competitive play. When players started posting their picks for Holy Epics in the forums, one of the most consistent choices was Divine Expulsion. So I listened to the community and Ascension became Expulsion. And finally, the card you're all wondering about. It doesn't need to compete with anything else, as it is in a league of its own. The "best card in Kingdoms" has long been a four of in any deck that could play it, and often pulled playing to Alchemy just so that they'd have access to its free, powerful effect. It's time to try a Standard that operates without this staple card. 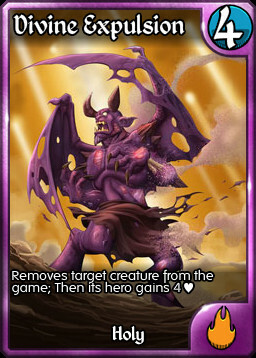 Rejuve will remain a powerful part of Legacy and Guild Wars though - a must have for anyone who plays in these formats. So much so that we've left it as the grand prize for defeating Nemesis once and for all. I doubt this will be a surprise to anyone. Since being buffed out of Lightning Bolt range, Caindra has seen play in both the Arena and in Tournament play. Just an incredible presence on the battlefield, Caindra can completely change the course of a battle. She makes for a powerful Legend that new players will be excited to open. Stay tuned for the full card list reveal, coming shortly!